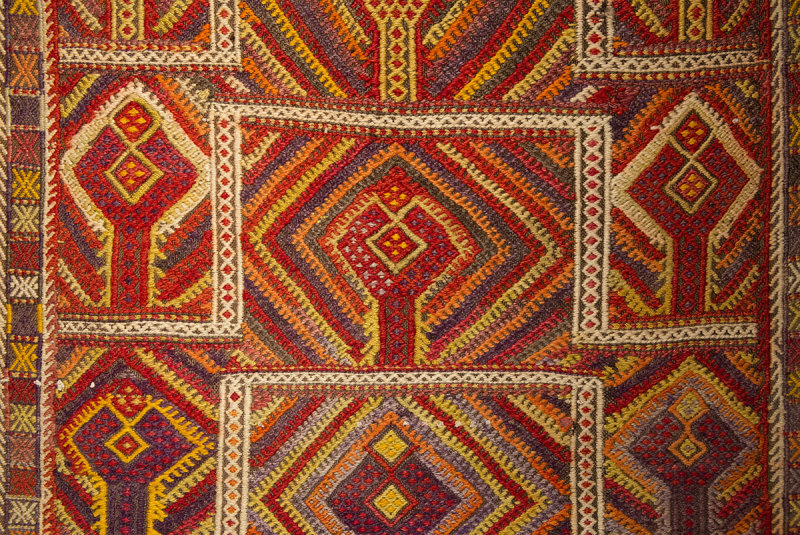 A prayer rug, woven with the ‘zili’ technique. ‘Zili’ is one of the four most prominent Anatolian flat-woven rug types; the other three are kilim, cicim (jijim) and sumak/soumak. The technique used for ‘zili’ is: on a plain woven underground, a second horizontal coloured weft strand (thicker than the one used for the underground) creates the decorative design, in which vertical and horizontal lines often dominate. The thickness of the second weft strand causes the impression of a second layer on top of the woven underground, which is – technically spoken – not the case. Compared to the similar ‘cicim’-technique (which creates designs along diagonal lines) the portions of the coloured weft strands on the upper side of the rug are (sometimes much) longer; this makes the ‘zili’-carpets more sensitive to wear, and less suited to be used as floor covers. Although this carpet shows plenty diagonal lines, since the visible portions of the coloured weft strands are double or triple in length compared to a normal ‘cicim’-technique – it has to be labeled as a ‘zili’. Both zili and cicim techniques are sometimes referred to as ‘brocading’. Many zili-weaves are from Yörük origin, and 100% wool (no cotton used). Sources: The Kavak Collection of Anatolian Rugs and Weaves, Antwerpen/Belgium. & ‘Günaydın Anadolu – Tradities van Turkije’ – cataloog Tentoonstelling Hessenhuis/Antwerpen 1988.